Better than Snickers – is that blasphemy? I also added sesame seeds to this one, and have added other seeds and even nuts in the past – really, anything will do. 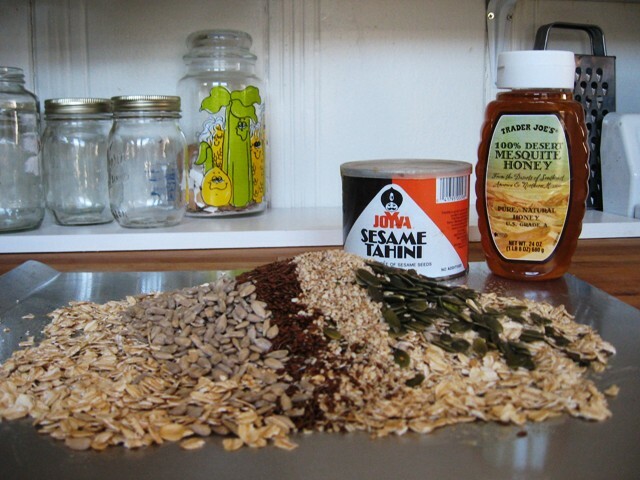 You could also substitute rye or kamut flakes for the oatmeal, although I haven’t tried that yet. Preheat the oven to 325º. Butter an 8-inch square baking pan (or if you’re doubling it, a 9×13 pan). 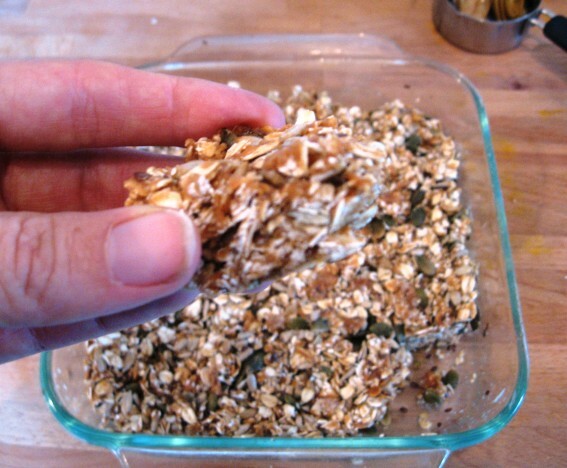 Spread the oatmeal and seeds on a baking sheet (you’ll mix them up and spread them out, not in a mound like the picture shows – also, you’ll hopefully have a rimmed baking sheet to avoid scattering seeds around your kitchen). Bake for 20 minutes, stirring twice to assure uniform toasting. Transfer to a medium bowl and set aside. Pour the honey into a small saucepan and bring to a boil. Reduce the heat to low and simmer for 7 minutes, or until the honey reaches 275º on a candy thermometer. (For those of us without candy thermometers [gasp! ], she provides more instruction…) At first the honey will expand and bubble up the sides of the pot. When it starts to condense and thicken it is ready. Stir in the butter (I use tahini in this – I love the added nutty taste, but I’m sure butter would be awesome too). Pour the hot syrup over the oat mixture and stir to combine evenly. Transfer the mixture to the baking pan. Let cool 2 minutes, then press firmly with lightly moistened hands. Let cool for 10 minutes more. Use a moistened knife to cut into 2 x 1-1/2 inch bars. Tightly wrap in plastic wrap or wax paper and store in a cool dry spot. These are great right away, because they maintain some extra chewiness, and are even better when they cool and become crisper. Watch out for a bit of a mess, though, as they have the tendency to crumble a bit. I’ll be taking them on the plane tonight for a high-altitude treat – beats the heck out of peanuts! Holy Frijoles! I made these and couldn’t stop eating them. (After one initial disaster of a pot of burned honey when I went to check my email.) I added the tahini AND a little butter, mixed some maple syrup into the honey, and used ground flax, since I ground my last bit of flax seeds last week. It reminds me of that honey-sesame candy, only softer, not so sticky to the teeth, and definitely better than Snickers!